Original and compelling, Laura Briggs's Reproducing Empire shows how, for both Puerto Ricans and North Americans, ideologies of sexuality, reproduction, and gender have shaped relations between the island and the mainland. 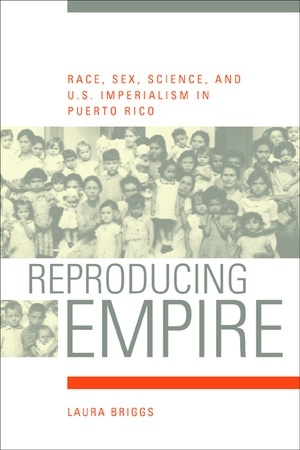 From science to public policy, the "culture of poverty" to overpopulation, feminism to Puerto Rican nationalism, this book uncovers the persistence of concerns about motherhood, prostitution, and family in shaping the beliefs and practices of virtually every player in the twentieth-century drama of Puerto Rican colonialism. In this way, it sheds light on the legacies haunting contemporary debates over globalization. Puerto Rico is a perfect lens through which to examine colonialism and globalization because for the past century it has been where the United States has expressed and fine-tuned its attitudes toward its own expansionism. Puerto Rico's history holds no simple lessons for present-day debate over globalization but does unearth some of its history. Reproducing Empire suggests that interventionist discourses of rescue, family, and sexuality fueled U.S. imperial projects and organized American colonialism. Through the politics, biology, and medicine of eugenics, prostitution, and birth control, the United States has justified its presence in the territory's politics and society. Briggs makes an innovative contribution to Puerto Rican and U.S. history, effectively arguing that gender has been crucial to the relationship between the United States and Puerto Rico, and more broadly, to U.S. expansion elsewhere. Laura Briggs is Assistant Professor in the Department of Women's Studies at the University of Arizona.